The Gin Guild Installation in the Mansion House preceded the WCD Mansion House Banquet on October 12. It has been a great honour and privilege to have been Grand Rectifier of the Gin Guild for the last two years, during a period of exceptional growth for the Gin category, both at home and abroad. The Gin Guild has played an important role in bringing members of the Gin industry together – distillers, marketers, writers and barmen – emphasising the importance of excellence in all aspects of gin distilling and promotion. With 249 members, the Gin Guild has developed very strongly since its foundation by the WCD in 2013. I gave my final speech as Grand Rectifier whereupon the role and title of Grand Rectifier passed from me to Ed Pilkington, marketing and innovation director for Diageo Europe, in a ceremony presided over by the Master of the WCD, who took the sash of office and placed it on the shoulders of the new Grand Rectifier. Ed Pilkington spoke of his pride in accepting the role, called me up to receive the badge of office for past Grand Rectifier – a gold sprig of juniper to be worn as a lapel badge, which replaces the solver sprig given to all members of the Guild on being installed as “Rectifiers”, the title applied to all members, and referring to the process of distilling gin. The previous Grand Rectifier, Christopher Hayman, Past Master of the WCD, is the other holder of the “golden sprig”. The new Grand Rectifier then installed over 20 new Wardens and Rectifiers. 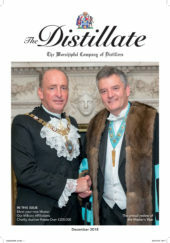 After the installations and photographs in the Long Parlour we moved to the Gin Guild bar for a celebratory gin and tonic and then moved back through the Long Parlour to join other guests waiting to be received by the Master and Mistress hosting the Mansion House Banquet attended by the Lord Mayor. The Gin bar was transformed into the Master’s Bar offering a range of spirits and champagne as the 260 Liverymen , members of the Gin Guild and guests gathered before making their way into the magnificent Egyptian Hall for the banquet. The splendour of the Hall was matched by the menu and choice of wines and spirits. Two pipers from the London Scottish Regiment, with whom we are affiliated, played during the Loving Cup ceremony. Speeches by the Lord Mayor, Dr Andrew Parmley, the Master and Air Marshal Sir David Walker were well received and the evening concluded with an impressive post horn duet performed by two buglers, each one positioned on a balcony at either end of the Hall. This performance, greatly appreciated for its clarity, speed and the lung capacity of each bugler received a huge round of applause, which concluded a spectacular and memorable evening. Conviviality, friendship andgastronomy celebrated in the Hall, where the Lord Mayor entertains World Leaders and Politicians, Captains of Industry and Ambassadors during his year of office. The WCD and the Gin Guild are privileged to experience such splendour for one night each year in his presence.